After waking up to a damp and foggy morning, Bob and I postponed our plans to drive directly to the Giant’s Causeway, in Northern Ireland. We thought a tour of the Bushmills Distillery would provide a great distraction while we waited for the skies to clear and that it would brace us for the day ahead, but frequent stops to take in the daunting sights along the Causeway Coast caused a substantial delay. 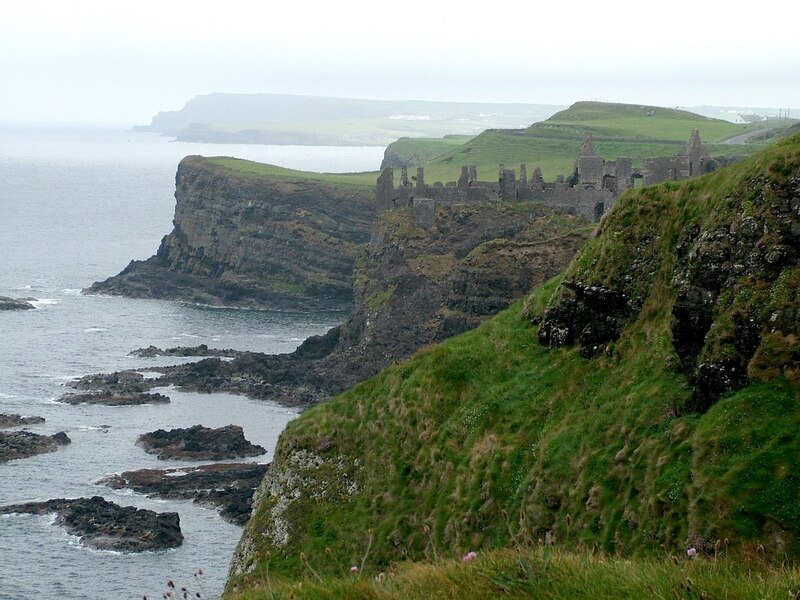 On one headland of that inspirational coastline, we discovered the dramatic ruins of Dunluce Castle. Our first glimpse of Dunluce Castle was from a fair distance across the water as we drove the coastal road east from Portrush. Perched vulnerably on a steep crag, this Castle once lost its kitchen into the sea when a violent storm grabbed it and wrenched it from its foundation. Even as the waves crashed against the cliffs on this calm day, it was not hard to imagine the frightening series of events that night. I had goosebumps just thinking about it. Once adjacent to the castle, our vantage point revealed the 17th century mainland courtyard where domestic buildings sit removed from the castle proper. It was easy to imagine the bustling merchant town that, at one time, stood in the fields surrounding the castle property. Built in 1608, the village flourished until consumed by fire during the Irish Rebellion in 1641. 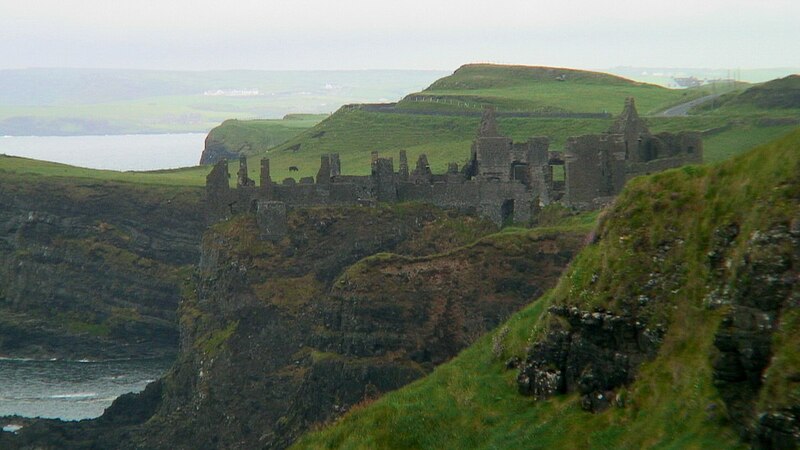 Even before that, though, an earlier settlement rose up in the shadow of Dunluce Castle. Those ruins were only recently uncovered by archeologists who date the rustic structures to the late 1400s. In order to access the castle from the courtyard, it was necessary to walk downhill to a narrow crossing where an arched walkway bridges the gap. This bridge is the only means of access to the rock upon which sits Dunluce Castle, so it was easy to see that an invading army would have been stopped in its tracks. The single footpath led to a drawbridge and a gatehouse that provided additional safeguards. 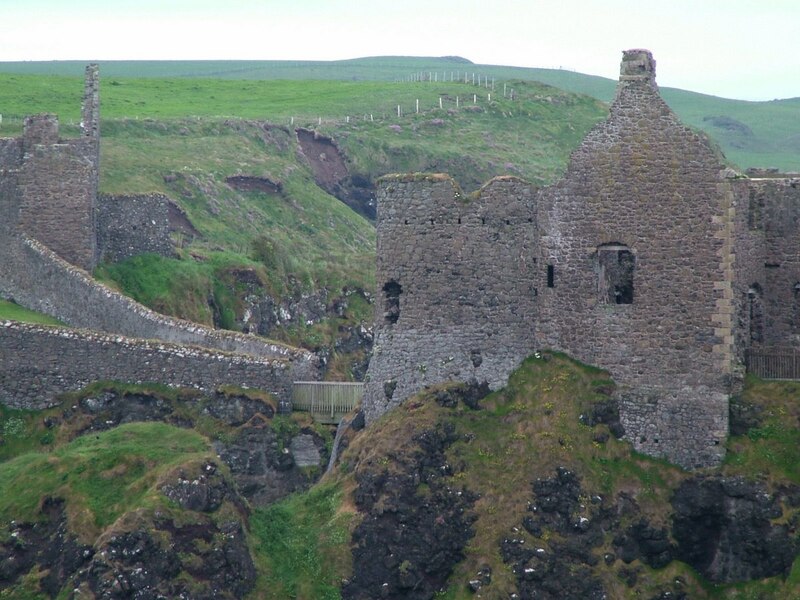 Two large drum towers that sit on the east side of Dunluce Castle are remains of the first castle built here in the year 1500. These towers are about 30 feet (9 m) in diameter and are relics of that erstwhile stronghold. 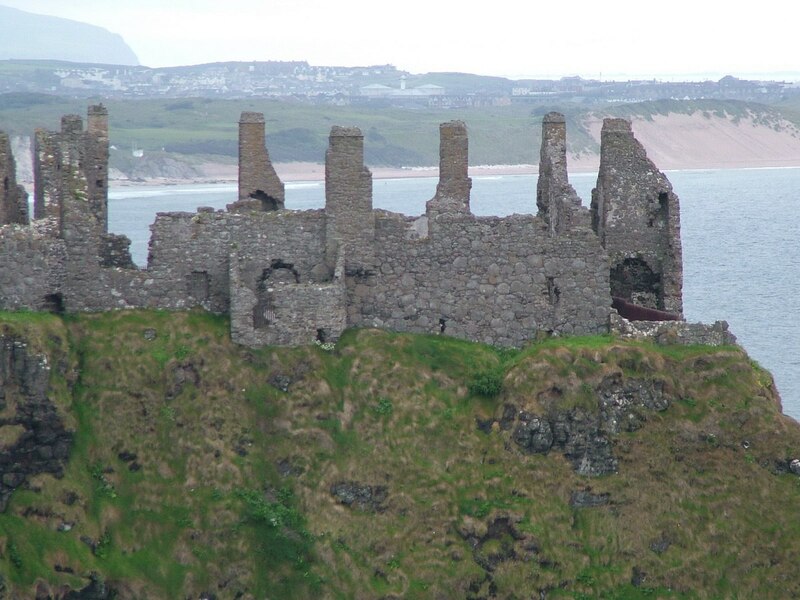 The buildings on the rock may have had their beginnings at the beginning of the 16th century, but over the centuries and under the control of several owners, many additions were made to the original structure expanding its prominence on the North Antrim coast. 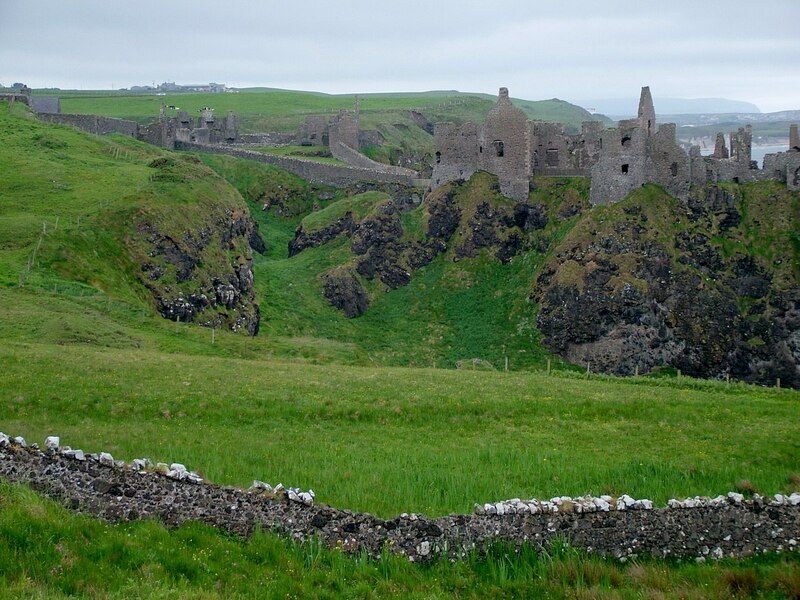 Only after the last resident, Randall MacDonnell, moved out in the mid-1600s did Dunluce Castle begin to finally fall into disrepair. 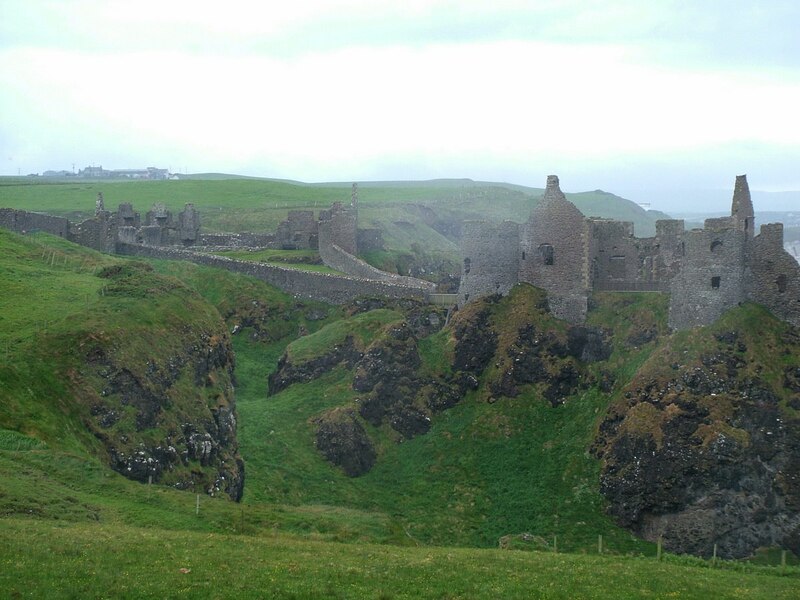 It was terribly unnerving to think of the generations of inhabitants that lived in Dunluce Castle situated as it is with extremely steep drops on either side. 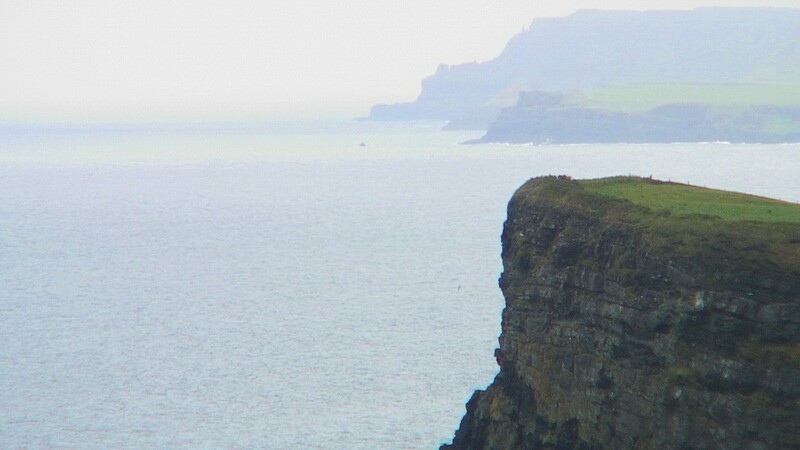 The basalt outcropping that forms the headland plunges straight into the sea, and it is this feature that probably figured into the attraction that early Christians and Vikings had for the dramatic location where the first Irish fort stood. 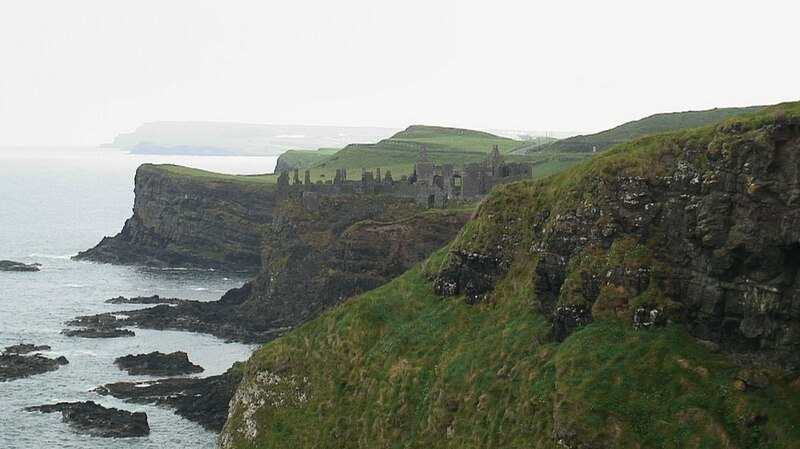 Dunluce Castle, as can be expected, changed hands several times over the years. The MacQuillan family arrived from Scotland in the 13th Century and, by the late 1400s, had begun construction of the original stronghold complete with the drum towers. 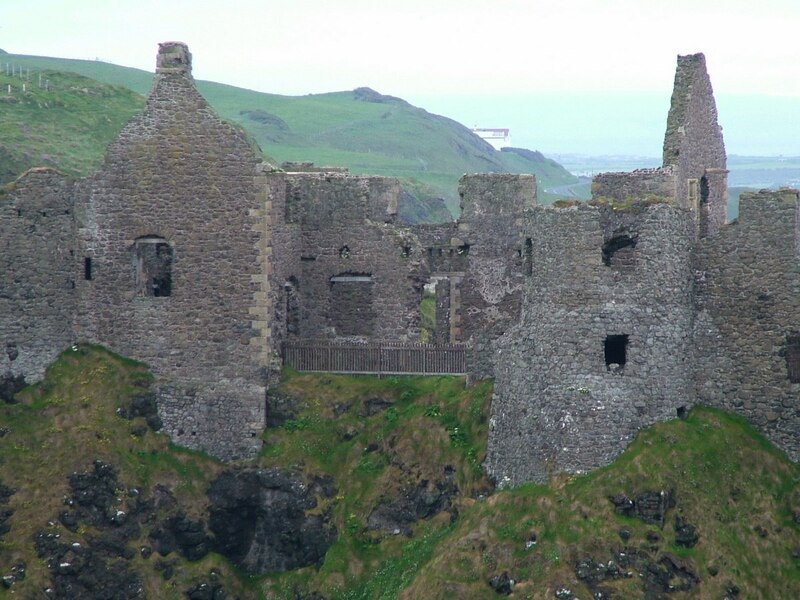 The MacDonnell clan, Scottish neighbours of the MacQuillan’s, arrived some 50 years later and fought to take ownership of the castle in the mid 16th century. 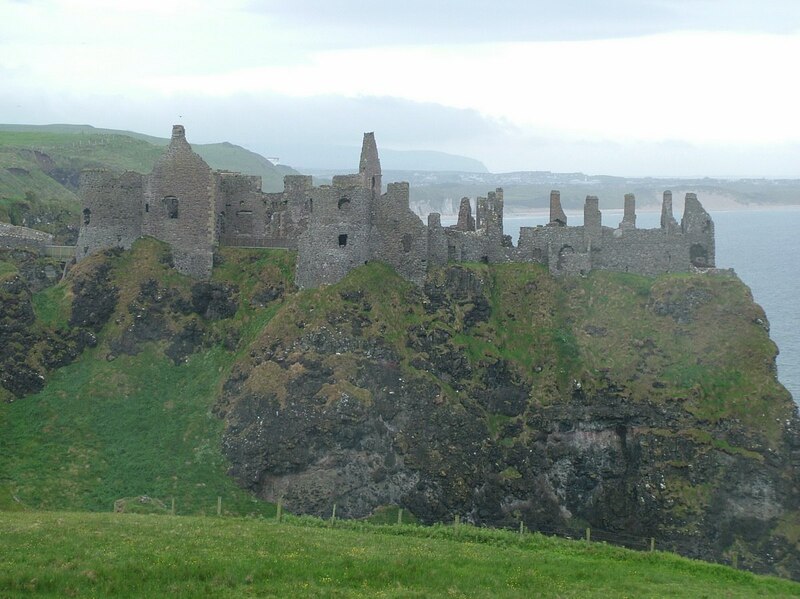 They founded the town of Dunluce nearby. The castle was constantly being fought over, and once the MacDonnell’s took over, they faced attacks by the English for over 100 years. 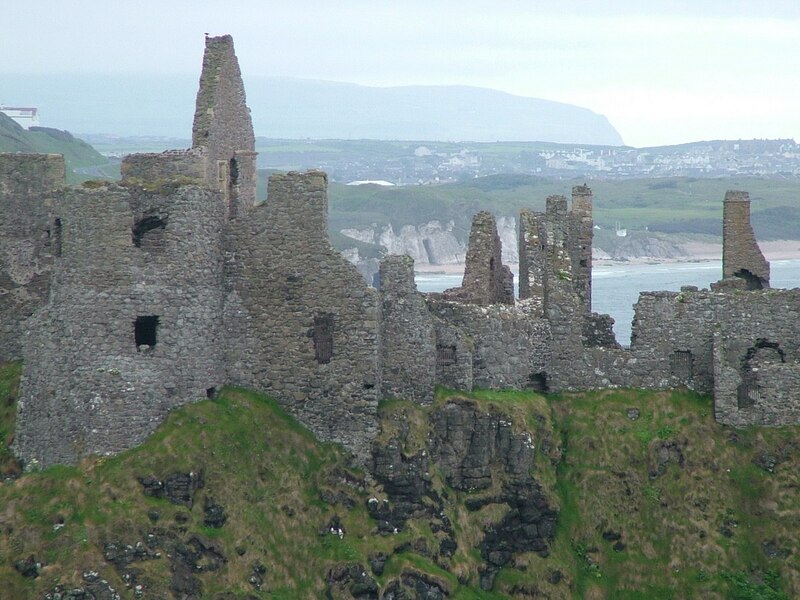 One failed attempt by the MacDonnell’s to keep control of the premises saw them scaling the cliff face, climbing the corner towers and eventually hanging the English captain in order to regain power. His ghost is said to still haunt the tower. But it was after part of the cliff face collapsed in the tragic storm of 1639, taking with it part of the scullery and reputedly seven of the cooks, that the wife declared she would no longer live in the castle. This was not the only tragedy to occur along the North Antrim Coast. One stormy night in 1588, onlookers at Dunluce Castle watched as the Girona, a galleass from the Spanish Armada, was driven onto rocks in a vicious gale. The shipwreck was notable for the massive loss of life, 1,291 people with only 9 survivors, and for the treasures that went to the bottom. The MacDonnell’s salvaged 3 brass cannons that were then installed at the gatehouses of the Castle, while funds derived from the sale of two recovered treasure chests went towards restoring the Castle. Dunluce Castle majestically crowns the precipitous basalt outcropping giving it unprecedented views of the ocean, and its tenuous connection to the mainland via the thin catwalk adds to the mystique of the location. Mermaid’s Cave carved out of the cliffs below by the turbulent waters of the sea has inspired tales of smugglers and mermaids, and talk of Spanish treasure hauled from sunken ships and secreted in its depths. There is some truth to that given that salvage attempts in the mid 1960s retrieved the largest Spanish Armada treasure ever recovered from a shipwreck…the Girona’s gold jewellery. This now-ruined medieval castle has also inspired authors and screenwriters. It is thought to have prompted C.S. 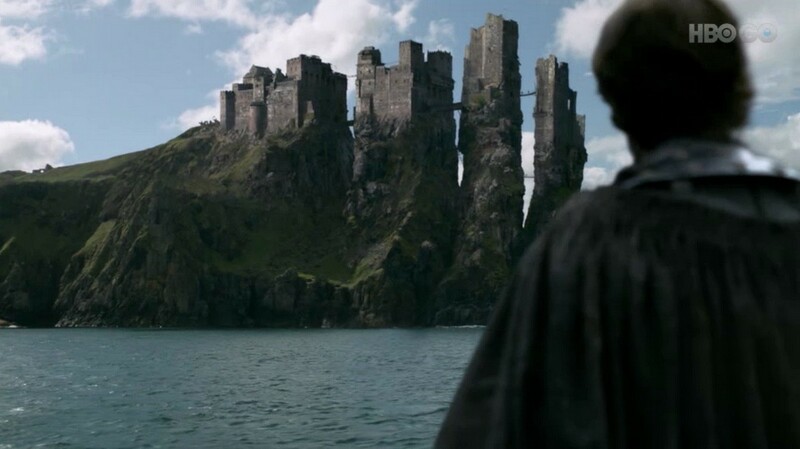 Lewis’ vision of Cair Paravel in Chronicles of Narnia, and more recently, the ruins are castle doubles for the Reaver stronghold of Pyke on the Iron Islands (seen above) in the popular television series, Game of Thrones. 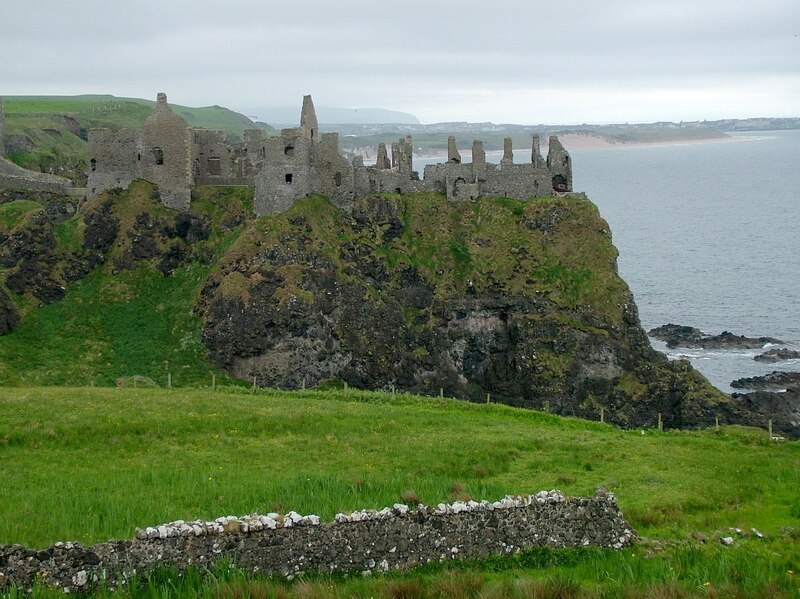 Viewed from afar, Dunluce Castle has an air of romanticism about it, but as the story goes, more than one spirit now frequents the deserted structures. During the reign of Lord McQuillan, one of his daughters, Maeve Roe, defied her father’s wishes to marry a relative. Maeve had fallen in love with one of her father’s prisoners, the son of an arch enemy, and to forestall developments in that relationship, Lord McQuillan locked his daughter in a castle tower. Maeve’s true love rescued her, they escaped to Mermaid’s Cove and then set off in a row boat. Sadly, their boat was dashed on the rocks killing both Maeve and her beloved. Maeve’s body was never recovered, and to this day, her spirit still climbs the tower steps. Bob and I were only able to enjoy distant views of Dunluce Castle since we were too early in the day for an onsite tour, but the iconic medieval castle still thrilled us. What’s not to enjoy when tales of battles royale and love vanquished spur the imagination and bring history to life. It was well worth the stop.